Traveling sprinklers are a true blessing if you have a large lawn that needs regular watering. Tractor water sprinklers, or walking sprinklers as they are sometimes called, have wheels that move the sprinkler forward. The best part is that these wheels do not require electricity or gasoline to run. They use the force with which water is projected from the hose to move around your lawn. Impressed? Here’s a list of some of the best traveling sprinklers available in the market, to help you choose your very own self propelled sprinkler. 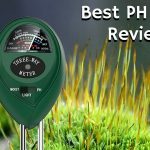 The device can travel up to 200 feet and covers an area of around 13,500 sq ft.
Its speed can be adjusted according to your need and soil type. It offers three speed choices. Comes with an automatic shut-off that minimizes water waste. The device is reported to have poor gears that can fail upon prolonged usage. It gives a low throughput which makes it take a long time to water a relatively small area. 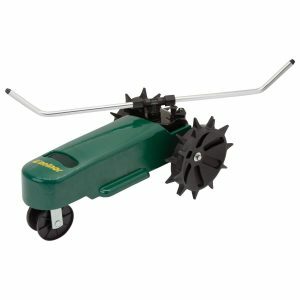 The sprinkler comes with 3-position adjustable speed control: In high gear, it travels at about 37 feet per hour. In low gear, it travels at 21 feet per hour approx. This makes it flexible in its function. You can adjust the pattern based on your lawn’s area. You can place the shut-off ramp at any point along the hose to stop the device. 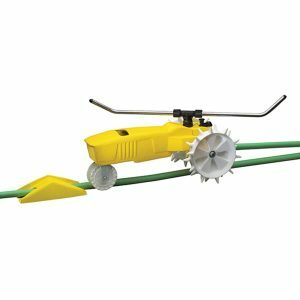 Comes with adjustable spray arms that can cover any diameter from 15 feet to 50 feet. 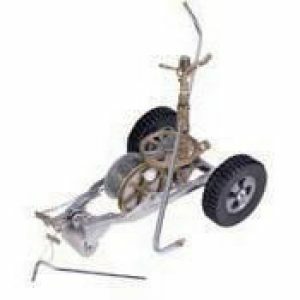 Has a sturdy, waterproof, cast iron body and its powder-coat paint makes it durable. The most obvious drawback is its heavy iron body that hardly makes it portable. Also, the heavy weight might cause it sink into soft soil, making it hard to travel. It has a cast iron body which means it will be more durable compared to other standard lawn sprinklers. To adjust the speed (faster/slower) for watering the lawn, you can choose from the two gear speeds. It has a spray coverage ranging from 15 feet to 45 feet and can cover a wide area of up to almost 12000 square feet. Lightweight design makes it easily movable around the corner. The attachment between the sprinkler and hose can be of better quality. 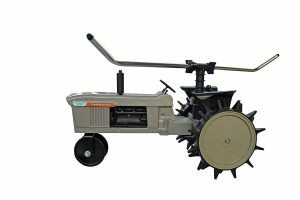 Though it has a lightweight design, the plastic parts make it less durable compared to other sturdy built machines. It has easy-to-use functionality and covers a wide area for irrigation. The six nozzles provide a smoother operation according to the situations and pressure needs. It has an inbuilt shut off valve which helps to turn off the sprinkler while you reach at the end. No need to come back at the power source to shut down the irrigation system. It is beneficial at the lawns where the in-ground sprinkler controller system is not allowed to use or can’t be installed. It is too costly for the home user. It’s not easy to store and carry due to heavyweight. It is designed such that it follows the path of your hose across the lawn. It is reported to move very slowly unless going down a slope. This makes it hard to use on an even patch of land. Also, the heavy body weighs the device down, making it hard for it move on a grass-free area. 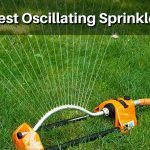 With a little research, it is not difficult for you to find an efficient and durable lawn sprinkler for your garden. Make sure that you pick one that is eco-friendly and saves water. 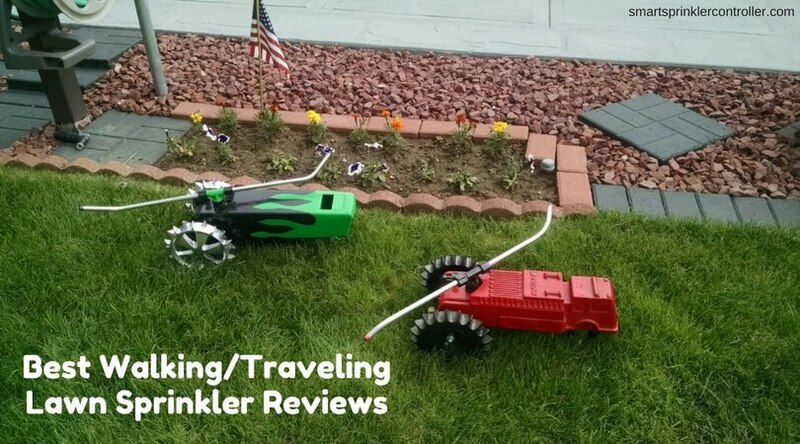 We hope our article makes your search for the perfect walking sprinkler a tad bit easier. Happy gardening! I was reading through some of your blog posts on this website and I believe this internet site is very informative!